As many new parents will tell you, swaddling can mean the difference between a happy, rested baby and cranky, sleepless nights. In fact, one of my favorite parenting books – The Happiest Baby on the Block by Dr. Harvey Karp – lists swaddling as one of the “5 S’s” to help babies keep babies calm and help parents survive the the first 12 weeks of infancy – the so-called fourth trimester. But why? During pregnancy, the baby is contained in an environment (the womb) where she is constantly being held. She is contained from almost every direction, and – particularly during the final weeks of pregnancy when things get pretty tight in there – is unable to move without experiencing some resistance. After birth, the baby is (quite literally) pushed into an environment where she isn’t contained all the time and where her limbs can move freely. While this freedom of movement is important for developing the muscles for rolling, sitting, crawling, and walking, it can be unnerving for baby. Free movement of the limbs can give the baby the sensation that she is falling, triggering the Moro (startle) reflex (see this post for more info on newborn reflexes). A generation ago, when babies were typically placed on their tummies to sleep, the problem of flailing arms and legs wasn’t a big problem. Gravity pressed the arms, legs, head, and body against the mattress, provided womb-like resistance to movement and a sense of comfort for baby. However, in the early 90’s, we learned that it was much safer for babies be placed on their “Back to Sleep” (for more on what is now known as “Safe to Sleep,” click here). While back sleeping is an important recommendation and has had a significant effect on reducing the risk of sudden infant death syndrome (SIDS), gravity works against the baby in this position. Instead of pressing the limbs against the mattress and their little bodies, gravity pulls the limbs away from the body which results in flailing motions and startling. Babies simply feel less secure in this position and most don’t sleep well without their arms and legs contained. That’s why most babies need a way to transition from the comfort of sleeping in a cozy womb to learn to sleep while fighting against pesky out-of-womb issues like gravity and moving limbs. That’s also why many frustrated (and tired) parents find that the “only way” their baby will sleep is if they’re being held (and grandparents often aren’t much help – they didn’t put babies on their backs to sleep and so many didn’t swaddle). With back-sleeping, you have to trick the baby into thinking she’s being held. 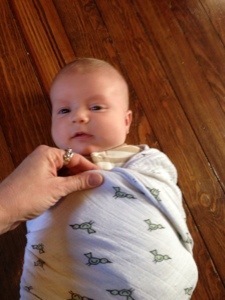 Enter swaddling. From a developmental perspective, swaddling is absolutely safe (and can even be helpful), but there are some things to consider before you swaddle. Because the arms are generally considered the “trigger” for the startle reflex, the arms and upper body should really be the focus of the swaddle. 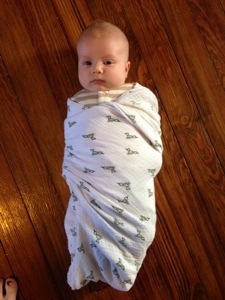 In fact, care should be taken NOT to bind the baby’s legs tightly together when swaddling. Newborns have shallow hip sockets, which means their hips can dislocate much more easily than an older child’s or adult’s. Keeping the legs apart is a stable position for the hip (this is also a consideration in baby wearing – I’ll cover this in a future post). Forcing the legs together is a more unstable position and increases the risk of hip dislocation. So care should be taken when swaddling to keep the legs wrapped loosely while tightly wrapping the arms and trunk. This can be tricky (especially for a wiggly older baby), which is why I love fool-proof products such as the SwaddleMe blanket or the Woombie that firmly contain the arms while leaving the legs in a loose pouch. However, you don’t need a special product for the perfect swaddle – all you need is a good-sized blanket with just a little bit of stretch (I love Aiden & Anais Swaddle blankets and have also had good luck with basic waffle-weave receiving blankets). These blankets should provide plenty of warmth without overheating baby, but – if you think your baby may be a bit warm – you may want to undress her down to a t-shirt or onesie before swaddling. First, lay the blanket on the floor or bed and fold the top corner down. 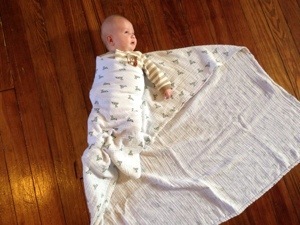 Next, lay the baby on the blanket with his shoulders at the top of – or just slightly below – the fold. Fold one side over the baby’s trunk, going over the arm on the same side and UNDER the arm on the opposite side. 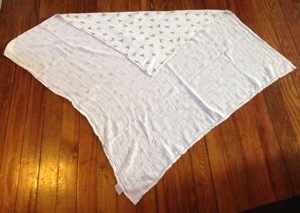 Tuck the blanket firmly under baby and give the loose end of the blanket a tug to keep everything tight. 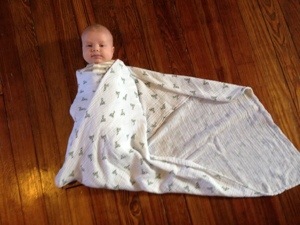 Take the remaining tail of the blanket and wrap it tightly around the baby’s arms, bringing it back around the front. Give it a good, firm pull. Don’t be afraid to make it nice and snug around the arms! Tuck the loose end in to complete the swaddle. 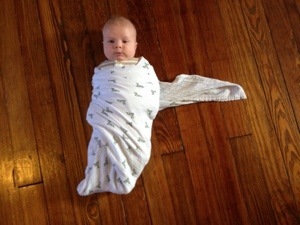 So how long should you swaddle? Swaddling is most helpful during the first 3-4 months of life, but some babies continue to need swaddling for a few more months (which is perfectly safe as long as they are still unable to roll over while swaddled). 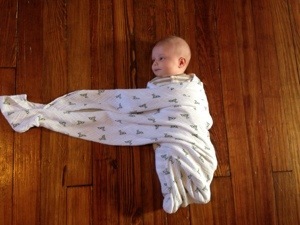 Once babies begin to gain more control of their movement, they are usually able to get into their own preferred position of comfort while sleeping and are less likely to startle, so the swaddle is not longer needed. 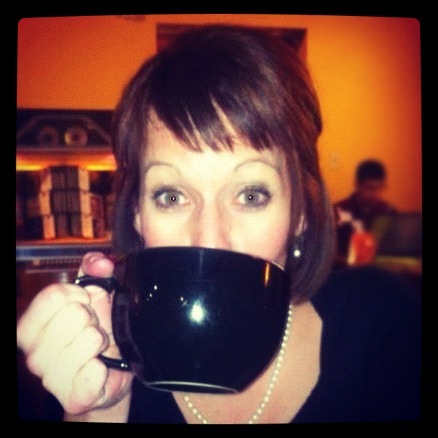 I was effective in weaning both of my older sons from the swaddle at 4-5 months by swaddling with one arm out, then the other arm out, then getting rid of the swaddle completely. 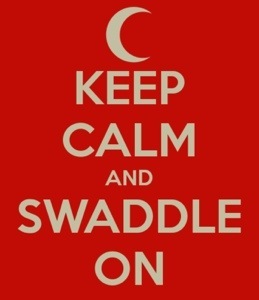 Of course, swaddling should only be used for calming a fussy baby and during sleeping. 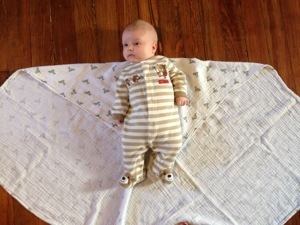 When baby is awake, he should be unwrapped so he learns how to move and control his limbs on his own. Laying down on an old-fashioned blanket on the floor during play time should give plenty of opportunity for movement and exploration, and all young babies should practice “tummy time” several times a day while awake with supervision. 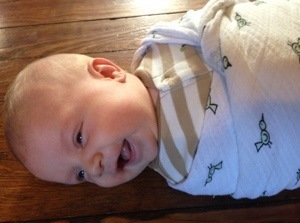 A swaddled newborn is a happy newborn!